popular destination for Chinese retirees and tourists. Non-Chinese tourists are just beginning to arrive in force, and the city is doing all they can to promote their unique positive attributes. 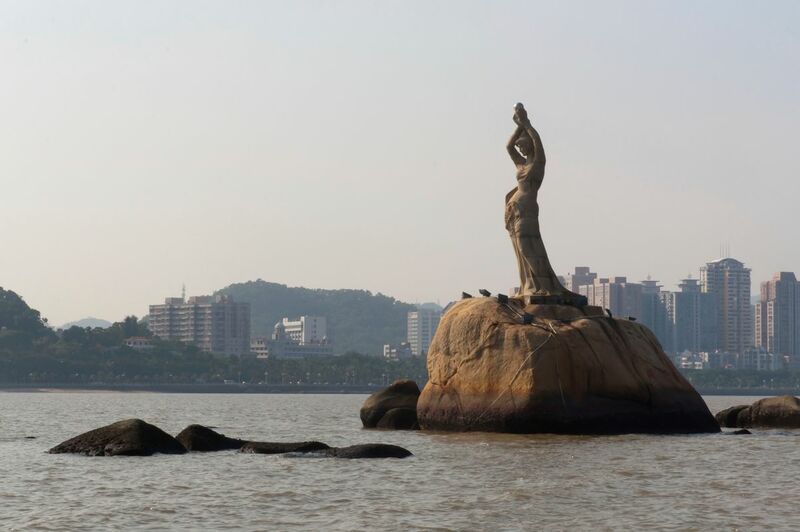 Zhuhai’s most popular attractions are its beaches and islands, which are easily reachable by ferry. The city is known as the city of one hundred islands, and it is easy to find quiet, secluded places one any number of them. Within the city, the most popular attractions are New Yuanming Palace, a replica of the Summer Palace in Beijing, and Lovers’ Road, a picturesque coastal walkway. Be sure to catch the Fisher Girl statue, which embodies a scene from a local myth, along Lovers’ Road. have been known to drop temperatures as low as -25 (10). The best time to visit this densely-populated city is from mid-October to December, when temperatures are mild and the rain tapers off. Be sure to plan around the Lunar New Year, China’s biggest holiday, when domestic tourists book up hotels and jam up public transportation. Zhuhai is near to Hong Kong. Many Chinese from China go through this place to Hong Kong. Everyday custom here is crowded and busy. The wrathet here is nice and warm.